We have many guests that fish with a spinning rod. Those who spin fish can enjoy fishing from the banks or fishing from a boat, our rentals or from their own. They run the gamut from armchair bank fishing with bait to technical ultralight spinning tackle using state-of-the-art artificials. Standard spinning tackle is the norm here: 5’ to 8’ rods, standard or ultralight reels spooled with 4 or 6 lb line, and lures from small Mepps, Cleos and Panther Martins to Countdown Rapalas will get the job done most days. The simplest bait fishing solution is usually Powerbait. The secret for most folks is to go smaller and lighter. In other words, lighter lines, lighter weights, and smaller lures. The tackle that a lot of folks bring has been set up for bass and needs to be scaled down for trout. Even though we don’t keep a lot of spinning tackle at the Lodge, we can help with the rigging and tell you where you can pick up what you need. We also have no problem whatsoever with independent guides picking people up at our Lodge. 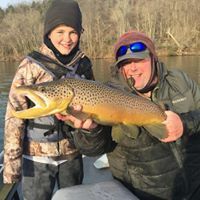 So no matter what you fish with, you’re certainly always welcome at Cranor’s Lodge, and we’ll help you any way we can.